I’ve been doing a ton of cooking lately – a first birthday party, followed by a Christmas party and I’ve still got a Christmas Eve party AND the big day itself to go! For the first birthday I was on the hunt for gluten free (or coeliac friendly) recipes. As with vegetarian food, I find it better to seek out those things that are naturally gluten free, or very nearly so, rather than try to adapt a full fat version of a recipe. A few years ago I went on a bit of a shortbread baking spree and remembered that many of the recipes made use of rice flour and/or polenta so I figured that I should be able to find, or at worst adapt, a gluten free recipe. And I was right – I found this recipe on the That’s Life site. It’s really simple and I think you’re probably better off not even bothering with the food processor in the first place. I did and just had to transfer the mix to a bowl to bring it to a dough! Sift together ½ cup of corn flour (do check that the corn flour is 100% corn and is gluten free if you’re catering for coeliacs), ½ cup of icing sugar (again, check it’s pure icing sugar and not an “icing mix”) and 1 cup of rice flour. Add 180g of unsalted butter. Now the butter can be cold and hard and you can grate it in, or you could use it slightly softened. If you do this first part in a food processor it doesn’t really matter. Mix with your hands until the mixture comes together in a very soft dough. Chill for an hour. To make life easy for yourself, roll the dough into a sausage or log – this way, when you come to bake the biscuits you can just cut off slices. So, while the chilling is going on, preheat your oven to 180°C (or 160°C fan). Line some baking trays with baking paper and then take a sharp knife to your log of shortbread. Take thin slices of shortbread, spread out on the baking tray (they’ll expand a little while cooking) and bake for 15-20 minutes. 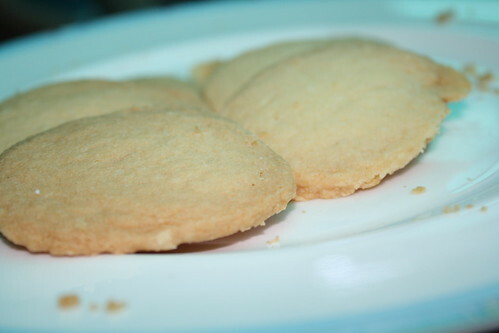 The edges of the shortbreads will start to go brown but you don’t want to over cook them. Remove from the oven and carefully place on racks to cool. Hot they will be very very fragile so use a slice and allow them to cool before hoeing in. Then make yourself a cup of tea and indulge! Glad they were a hit. There are quite a few gluten free recipes on Eating Adelaide but I don’t necessarily do a good job of tagging them! Next time try out these gluten free brownies (so good, you wouldn’t know they were gluten free, apparently! ).